Many Waitangi Tribunal hearings are held as close as possible to the places, events and claimants concerned. 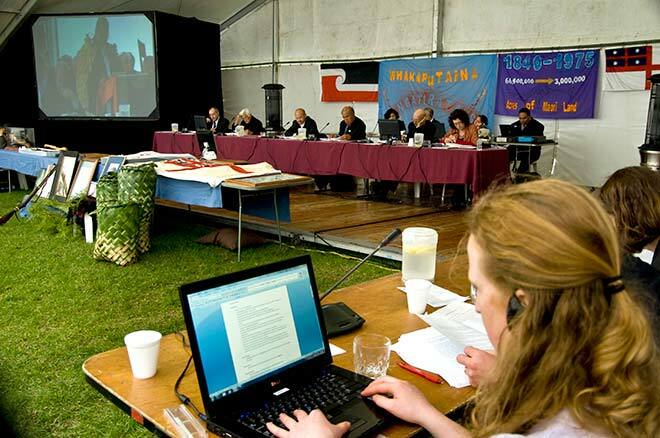 This is the first hearing of the Te Paparahi o te Raki (Northland) district inquiry, held in May 2010 in a marquee in the grounds of the Waitangi Treaty House in the Bay of Islands. At rear sit the tribunal members. In the foreground are tribunal staff wearing headsets so they can receive a simultaneous translation into English of speeches and evidence given in Māori.